Fame tracker displays your current (and more accurate)) fame to tribes, civilizations and high powers; the main focus is on tribes. In the case a that the fame with a particular tribe has not yet been updated the default value to your race is displayed. Each tribe has its own profile with a list of persons, where an icon indicates if it is possible to take his/her missions (according to your fame). You can see recent fame changes and full history of a tribe fame changes since your first use of this tool. Every time you open the Fame tracker it gets your current fame values from Ryzom API and saves new changes into database. Comparing these records allows you to see the complete history of any particular tribe fame since the first tool use. Using this tool requires you to enter valid API key that allows to read fame for your character. For that it is necessary that the key data contains section P01. You are allowed to remove the key and all recorded fame changes at any time you wish in your profile key settings. The tool is currently completely localised into English and German. French and Spanish is partially done. All strings are translatable into any other language. You can set your preferred language in your profile. If you would like to help with localisation into your preferred language, let me know. Very nice! I like the details. 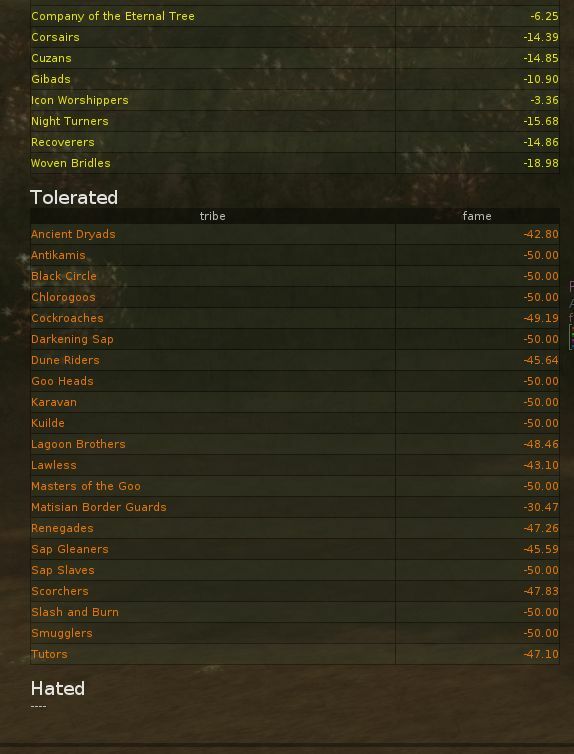 One thing I would like to see in a future update is the ability to sort by fame with those tribes that are at/below -50 are all grouped together. It'd be nice to see at a glance who I am KoS with. But for a v0.1 I think it's a great piece of work! The BM Fame Tracker app (/appzone 855) sorts them that way. The two apps are well done and very similar. I used the BM one when I was looking to get off all tribes KoS list and combined with the Bunny Fame Tool (listing who I needed to see to get missions appropriate for my fame), made the task go very quickly. -Moniq added the bar graphs w/ the colors, BM just has the numbers. -It looks like Moniq's retains the last activities. -If you havent done activity in current session, BM goes to "Clean Screen" mode in that respect. -BMs gives ya 2 (0.00) , Moniq gives ya 3 (0.000). BM does the sorting you were looking for. I'll have to play with Moniq's a bit more but next task in that department will be getting all to max fame and not ready to tackle that one at the moment. I think you will find either one a great aid if you are chasing the "Spirit of Sally Field Title". When no one will KoS you any longer, this is what it looks like.... no one listed under hated. In fact it can be changed in internal app config. Thinking about allow users to set own number of decimal places (and datetime format). Anyone interested in such options? I don't understand what you want to remove. You can see every changeset (all changes in one update) - click date. All history can be removed, if you remain valid API key, all changes to default fame will be saved in one update as on first use. -I would like to be able to turn off the column that tells me what fame my toon had when I first started oh so long agao :) . 3. What i got from tribes in last 8 minutes between saves ... if clicking on that would bring up drop down, to show "since log in" but not if it costs me another column on screen. What I did last Wednesday, I dont want to see on a dat to day basis ... but if sum1 asked... how much did ya get for that fame mission we did last week, to be able to retrive it with a few clicks would be super cool. So, not suggestion you take anything out, and again its not a criticism. I am saying that the option to hide columns would make it more useful the way I approach fame grinding. If the option made it into next version, I would show just those 3 columns 99% of the time so I can access and absorb what I want to focus on that much quicker. It must have been monumental effort to program it to go out and get all that stuff. But a clean UI has value also, which is why so may program windows show a few key elements on screen by default (aka clean screen) and **if you want more info"", it is accessible thru the "More Info" button. Woot ! Thanks for adding the Homin search to RyGReg. I mention it here, because this is the concept I was referring to above. I RyGReg I get to the Bunnies page and I see the basic stuff... **If** I want more info, I can click members ... if it was just there by default would be too much. ... are similar when you use an English interface (in ryzom AND in bm). 1. the bm search can't find what we want (as bm don't recog' the french names). With the new Moniq's app, it's really easy for me to find all I need to up my tribes fames D as the strings sent to bm are translated in english by her app ! Edited 3 times | Last edited by Tamarea (2 years ago) | Reason: Edit to activate the link. It's not really a matter of being satisfied. I was impressed with the effort put in and the time it must have taken. But, that being said, while I love having the info at my fingertips, it was just TMI for everyday usage and found it too busy. Purpose was to provide feedback / suggestions so that when you make edits and improvements, some usability enhancements might give the app wider appeal.